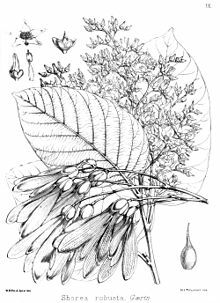 This tree is native to southern Asia, ranging south of the Himalaya, from Myanmar in the east to Nepal, India and Bangladesh. In Nepal, it is found mostly in the terai region from east to west, especially, in the Churia range (the Shivalik Hill Churia Range) in the subtropical climate zone. There are many protected areas, such as Chitwan National Park, Bardiya National Park Bardia National Park, Shukla Phat National Parks, etc., where there are dense forests of huge sal trees. It is also found in the lower belt of the hilly region and inner terai. In India, it extends from Assam, Bengal, Orissa and Jharkhand west to the Shivalik Hills in Haryana, east of the Yamuna. The range also extends through the Eastern Ghats and to the eastern Vindhya and Satpura ranges of central India. It is often the dominant tree in the forests where it occurs. Sal is moderate to slow growing, and can attain heights of 30 to 35 m and a trunk diameter of up to 2-2.5 m. The leaves are 10–25 cm long and 5–15 cm broad. In wetter areas, it is evergreen; in drier areas, it is dry-season deciduous, shedding most of the leaves in between February to April, leafing out again in April and May. Queen Maya giving birth to the Buddha In Hindu tradition, the sal tree is said to be favoured by Vishnu. Its name shala, shaal or sal, comes from Sanskrit; other names in the Sanskrit language are ashvakarna, chiraparna and sarja, among many others. 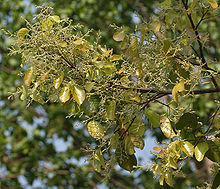 The sal tree is often confused with the ashoka tree (Saraca indica) in the ancient literature of the Indian Subcontinent. In Buddhist tradition, it is said that Queen Maya of Sakya gave birth to Gautama Buddha under a sal tree or an asoka tree in a garden in Lumbini, in south Nepal, while grasping its branch. When this event took place, Queen Maya was en route to birth him in his grandfather's kingdom. There is a standard decorative element of Hindu Indian sculpture which originated in a yakshi grasping the branch of a flowering tree while setting her foot against its roots. This decorative sculptural element was integrated into Indian temple architecture as salabhanjika or "sal tree maiden", although it is not clear either whether it is a sal tree or an asoka tree. In Kathmandu Valley of Nepal, one can find typical Nepali pagoda temple architectures with very rich wooden carvings, and most of the temples, such as Nyatapol Temple (Nyatapola), are made of bricks and sal tree wood.